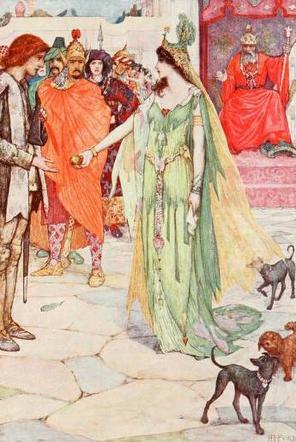 “The princess chooses.” Illustration by H.J. Ford. Published in The Olive Fairy Book by Andrew Lang(1907), Longmans and Green. Read Armenian folk tales collected from author Andrew Lang in a delightful collection suitable for children of all ages. See list of Armenian folktales. About: Armenian folk tales are imbued with morals meant to guide and inspire children, and they place a strong emphasis on cooperation, kindness and wisdom. The stories are a reminder that there are many good lessons to learn in life, but many people do not pay close enough attention to benefit from them. If you pay attention, and listen to your elders, your patience and convictions will be rewarded. The folk tales of Armenia are truly wonderful stories for children because they are both a moral compass and delightful means of entertainment. Andrew Lang collected several Armenian fairy tales in his series of fairy tale books.